Let us give glory and chant hymns to thank our greatly compassionate Lord who in these evil times deems us worthy to see rising in the darkness new luminaries of the spiritual firmament of our Orthodox Church. These bright lights cheer and gladden the faithful but put unbelievers to shame. Shut are the mouths of the ungodly who seek to excuse their unbelief by the claim that today people no longer become saints, as though our Faith and Christ who is the Head and of whom the Apostle Paul says, "Christ, the same yesterday and today and unto the ages" had changed. Besides the ancient saints, righteous hierarchs, and martyrs, a great and, shining halo of new saints, (most of them martyrs) has appeared from the fall of Constantinople until today. They have strengthened the Faith by martyrdom. They adorned with new and unfading crowns our Orthodox Church, which has stood alone as unchanging and immovable from the time of the Apostles who founded her. This recalls the words of Haggai the Prophet, who said; "Great shall be the glory of this house (that is, the Church); the last greater than the first." (Haggai 2:9). One of these new saints is John the Russian, whose holy tabernacle is the boast of the blessed island of Evvia. Here Saint John deigned to rest and further to sanctify the place that had already been hallowed by the righteous David the Elder who is commemorated on Nov. 1 and many other saints. The righteous John was born in a village in southern Russia, of pious Orthodox parents, for the blessed Russians have the same spiritual Mother as the Greeks-the Orthodox Church-and has given birth to many great saints. 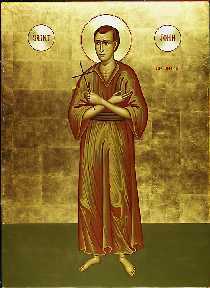 Saint John was born around 1690, during the reign of Peter the Great. When John was a brave lad he served as a soldier in the war which that daring Tsar was then waging against the Ottoman Empire in the year 1711. In this war, John was taken prisoner by Tartars along with thousands of other Russians. The Tartars sold him to a Muslim cavalry officer who lived in Prokopion in Asia Minor, near Caesarea of Cappadocia, and this Aga carried John to his village. At this time Turkey was filled with a multitude of Muscovite slaves who groaned under the harsh Muslim yoke. Sadly, the majority of these loathsome wretches, to lighten their burden, denied the Faith of Christ and embraced Islam. John, however, had been nurtured from childhood " in the instruction and admonition of the Lord," and he loved God and the religion of his fathers exceedingly. Indeed, he was one of those young men whom the knowledge of God makes wise. As the sage Solomon declared, "The just man is wise even in his youth. For honourable age is not that which standeth in length of time, nor that which is measured by number of years. But wisdom is the gray hair unto men, and an unspotted life is old age (Wisdom 4:8,9)." Possessing that knowledge which God imparts to those who love him, blessed John was patient in the ill-treatment of his master and the insults and annoyances of the Muslims who called him Kafir, which means unbeliever. To show their contempt and aversion. Prokopion was the site of an army camp of the Christian-hating Jannisaries, who were sons of Christians taken from their parents while young and raised as fanatical Muslim soldiers. John was a particular object of hatred to the Jannisaries because to his master and to all who urged him to deny his Faith he answered with conviction that he preferred to die rather than fall into such a fearful sin. To the Aga he said, "If you leave me free in my religion, I will be very eager to carry out your commands. But if you try to force me to change my faith, I will first surrender my head. I was born a Christian and a Christian I shall die." Seeing John's faith and hearing his confession, God at length softened the Turk's hard heart so that at last the Aga relented. From then on John was left in peace without further threats from his Muslim lord who kept him in a stable to care for animals. In one comer of the stable John would lie his tired body down to rest. John thanked God for being deemed worthy to have as a bed a manger like the one in which our Lord Jesus Christ had likewise lain at his birth. Dedicated to his work, John affectionately cared for the animals; and they, perceiving the love that the saint had for them, would look for him expectantly whenever he was absent. When he petted them, they looked at him with love and whinnied with joy as though they were talking with him. As time passed, the Aga and his wife came to love John and gave him a small room near the hayloft. Even so, John refused this continuing to sleep in his beloved stable to bring his body into subjection by privation and asceticism amid the reek of the animals and the stamping of their feet. At night, however, that stable was filled with the prayers of the saint, and the smell would become an odor of a spiritual fragrance. Blessed John made that stable a hermitage, living there according to the rule of the Fathers, kneeling and praying for hours at times taking a little rest by curling up on the hay with no covering except for an old coat. Often he took only a little bread and water, fasting on most days and quietly chanting psalms in Slavonic. "He that dwelleth in the help of the Most High shall abide in the shelter of the God of heaven. He shall say to the Lord: Thou art my helper and my refuge. He is my God, and I will hope in him. For he shall deliver thee from the snare of the hunters and from every troubling word (Ps. 90:1-3)." "They laid me in the lowest pit, in darkness and in the shadow of death (Ps. 87:6)." "Unto the Lord in mine affliction have I cried, and he heard me (Ps. 119:1)." "The Lord shall keep thy coming in and going out, from henceforth and forevermore (Ps. 120:8)." "Unto thee have I lifted up my eyes, unto thee that dwellest in heaven. Behold, as the eyes of servants look unto the hands of their masters, so our eyes look unto the Lord our God, until he take pity on us (Ps. 122:1,2)." John would even silently chant psalms while he followed the horse of his master as hostler when the master rode in the country. The blessing that the saint brought to his master's house soon enabled that cavalry officer to grow rich and become powerful in Prokopion. The holy stable boy - besides the prayers and fasting which he carried on day and night, winter and summer, inside that stable while lying upon the dung like another Job - would go at night and keep vigil in the narthex of the Chapel of Saint George, which was built in the hollow of a rock near the house of his master. John would go there secretly at night, and every Saturday he partook of the immaculate Mysteries. Greek Orthodox clergy were living in Prokopion serving the local native Greek population as well as the Russian slaves of the Turks. The Lord, who examines the hearts and the reins, looked upon his faithful slave and caused John's fellow slaves and other believers who had previously done so to cease mocking and insulting him. The Lord continued to bestow riches on John's master, who understood from what source such blessings came and proclaimed this to his fellow citizens. After the Aga had become wealthy, he determined to go on the annual pilgrimage to Mecca to give thanks to God for his blessings, which he actually received through the intercessions of Saint John and not from any devotion to the Islamic religion, and to offer sacrifice for his sins. The Hadj, the annual pilgrimage to Mecca, is commanded of Muslims to make at least once in their lifetime. After leaving Prokopion, and enduring the hardships suffered in those times by pilgrims, he arrived at the holy city of the Muslims. Meanwhile, some days after his departure, the Aga's wife gave a banquet, at which she invited her husband's relatives and friends to rejoice and to pray that he might return safe from his journey. Blessed John served at table. Pilaf, a dish favored by the Aga, was placed on the table. Then the mistress remembered her hus-band and exclaimed to John, "How much pleasure your master would have if he were here now and could eat this pilaf with us!" John then asked for a plate of the pilaf, saying that he would send it to his master in Mecca. Upon hearing these words, the guests laughed. The mistress told the cook to give John a plate of the food, thinking that he would either eat it himself or carry it to some poor Christian family as was his custom. Taking the dish, the saint went to the stable where he knelt and prayed from the depths of his heart that almighty God would send the food to his master in whatever manner he might choose. In his simplicity the blessed one had faith that the Lord would hearken to his prayer and that the food would arrive in Mecca by supernatural means. He believed "without doubting," according to the word of the Lord that God would perform this miracle. As the great ascetic Saint Isaac the Syrian writes, "These supernatural things will occur for those who are simple in mind and fervent in the hope." Indeed the plate of food vanished from before John's eyes. Then the holy one returned to the dining room and told his mistress that he had sent the pilaf to his master. "Some time later the Aga returned from Mecca, and to the amazement of his household brought with him the very copper plate that had held the food. Only blessed John was not surprised. The Aga told his household, "On that exact day (that is, on the day of his wife's banquet in Prokopion) as I was returning from the Great Mosque to the house where I stayed, I found this plate filled with pilaf on the table in a room that I had locked. I stood pondering who could have brought it. Above all, I could not understand how the door which I had locked well had been opened. Not knowing how to explain this mystery, I examined the plate of steaming pilaf. I saw with amazement that my name was engraved in the copper just as all such vessels in our house. Despite confusion from that unexplainable circumstance, I sat down and ate the pilaf with great relish. Observe the plate which I have brought back. It is truly ours. For the sake of Allah, I do not understand how it came all the way to Mecca, or who brought it." When the Aga's household heard this, they marveled. The wife told how John had asked for the plate saying that he would send it to Mecca, and how they had laughed to hear him say that he had sent it. Behold, what he had said was true! This miracle was soon made known to the whole village and surrounding area, and from now on John was considered righteous and beloved of God. No one any longer dared to bother the holy one but rather looked upon him with fear and reverence. His master and his master's wife esteemed him all the more, and entreated him again to leave the stable and occupy a more comfortable dwelling. Even so, John refused to change his residence and continued to live as an ascetic, laboring as before to care for the animals and eagerly obeying the commands of his master. Saint John spent his nights in prayer and psalmody, according to the word of the Lord who says, "Render unto Caesar the things which are Caesar's, and unto God the things which are God's." John approached the end of his life after several years of fasting, prayer, and sleeping on the ground. Falling ill, he lay on the straw in the stable that he had sanctified with his supplications and privations for the love of Christ who became man for us and was crucified for our sake. Foreseeing his end, John called for a priest and asked to partake of the immaculate Mysteries. Because of the fanaticism of the Turks, the priest was afraid to openly bring the Holy Mysteries into the stable. He was made wise with divine enlightenment however, and, taking an apple, he dug the core out, lined the cavity with beeswax, and placed the divine Communion inside. Thus he went to the stable and gave Communion to blessed John. After receiving the immaculate Body and Blood of the Lord, John surrendered his holy soul into the hands of God whom he loved so much. The date of his falling asleep was May 27, 1730. In this manner, then, reposed Saint John the Russian, a new Job who passed his life upon a dung heap, a second Lazarus who endured the mockings of his fellow servants and whose wounds his master's dogs licked. John was about forty years old at the time of his repose. Because he was beloved by God, the Lord brought John quickly near his throne that he might suffer no more torment in this sinful world, and that he might rejoice in the tents of the righteous where there is neither pain, nor sorrow, nor sighing, but the untroubled sound of those that keep festival and cry unceasingly, "O Lord, glory to thee!" We should recall the Prophet King Solomon's words on the death of a righteous man, "He pleased God, and was beloved of him: so that living among sinners he was translated. Yea, speedily was he taken away, lest that wickedness should alter his understanding, or deceit beguile his soul. For the bewitching of wickedness doth obscure things that are honest; and the wandering of concupiscence doth undermine the simple mind. He, being made perfect in a short time, fulfilled a long time: for his soul pleased the Lord; therefore, hasted he to take him away from among the wicked. This the people saw, and understood not, neither laid they up this in their minds, that his grace and mercy is with his saints, and that he hath respect unto his chosen (Wisdom 4:10-15)." Yes, the world lives carnally seeking to please only the senses and eating, drinking, revelling, and caring only for "the things of vanity and the much afflicted flesh." The senses, together with tangible things and delights of this world, were fashioned by God so that it is no sin for a man to rejoice in this world. Even so, he should not be consumed wholly by material things, but should take care also for the things of the spirit, keeping in mind that in the temporary body there dwells an immortal soul that, in the Lord's words, is as much more honored and valued than the body as the body is held important than its clothing. If a man truly believes this, he will take care for his salvation and will be blessed in this would with the joy of a pure conscience, and in the next (which is eternal) he will rejoice in the bosom of Abraham. If he rejects God and his Word, he will become wretched and unhappy, even though he acquires many possessions, great worldly glory and honor. According to the words which the all-holy and truthful Lord: For what will it profit a man if he wins the whole world and loses his soul, or what can a man give in exchange for his soul? Thrice-blessed therefore is the man who has treasured these words in the depths of his heart, hearkening to them until his last breath, conforming to them, and walking always according to them. Blessed and thrice-blessed therefore was the holy John, whose memory we celebrate today with great compunction and spiritual joy. He knew few letters and neither did he know the evils of the world. He lived far from complex systems of humanistic rationalism, remaining simple, poor in spirit, and therefore full of faith. The Holy Spirit dwelled in his heart. Within a disdained and tyrannized body, within a quiet and ragged slave, there burned the mystical spark of faith. "The people saw, and understood not, neither laid they up this in their minds." For the carnal men around him were inwardly dark like extinguished lanterns, beholding the saint, they understood nothing because they saw only with bodily eyes, not having-wretched as they were-spiritual eyes for seeing the holy mystery of his life. They, with earthly pride, considered him insane for preferring to sleep with animals, for avoiding men, for fasting, for dressing in rags, for silently en-during abuses and insults, and for not lifting his eyes to the face of a woman. Who of the clever of this world would have surmised that this "insane" person, this fool for Christ, was the wisest of the wise because he possessed that foolishness in Christ that makes manifest the revelation of great and terrible mysteries to him who possesses such foolishness and bestows upon him the great hope of immortality? As we celebrate the feast of the righteous John with psalms and hymns, we are assured that the saint is at this moment among us living and crying out, "Rejoice" in the midst of glory and effulgence. Where are those who saddened and despised our holy John? Where are the mighty of the earth? Where is the Muslim master of this slave who was yet free? Where are the fearsome Jannisaries? Where are the Tartars who bound him and beat him and sold him like an animal? They are dispelled like morning mist and "their bones are scattered in hades," according to David, the Prophet-King. The tombstone of oblivion has covered them. In Jerusalem on high, the dwelling of the First-born where there are found the blessed souls of the saints who endured privation in this world as to pass through "the narrow and afflicted way that leadeth unto life," there rejoices also the humble John whom we celebrate today, brother to animals, new Job, and second Lazarus. In the other life, those who grieved the saint and those who indulged their passions are groaning. Behold what the Prophet King Solomon says concerning the righteous man and his persecutors, when they open their eyes after death, then shall the righteous man stand in great boldness before the face of such as have afflicted him, and made no account of his labors. When they see it, they shall be troubled with terrible fear, and shall be amazed at the strangeness of his salvation, so far beyond all that they looked for. And they repenting and groaning for anguish of spirit shall say within themselves, "This was he, who we held sometimes in derision, and a proverb of reproach; we fools accounted his life madness, and his end to be without honour. Now is he numbered among the children of God, and his lot is among the saints! Therefore have we erred from the way of truth, and the light of righteousness hath not shined unto us, and the sun of righteousness rose not upon us. We wearied ourselves in the way of wickedness and destruction: yea, we have gone through deserts, where there lay no way, but as for the way of the Lord, we have not known it. What hath pride profited us, or what good hath riches with our vaunting brought us? All those things are passed away like a shadow, and as a post hasted by, and as a ship that passes over the waves of the water, which when it gone by, the trace thereof cannot be found, neither the pathway of the keel in the waves! Even so we in like manner, as soon as we were born, began to draw to our end, and had our wickedness. For the hope of the ungodly is like dust that is blown away with the wind, like a thin froth that is driven away with the storm, like as the smoke which is dispersed here and there with a tem-pest, and passes away as the remembrance of a guest that tarries but a day (Wisdom 5:1-14)." These things will the lawless say in the other world where the right-judging Lord shall judge man. They will receive no benefit from their change of heart after death for in hades there is no repentance. Saint John the Russian reposed in the Lord and received the recompense of the labors and toils that he endured for Christ, whom he loved more than all corrupt and fleeting things so that now, wearing a crown in heaven, he rejoices with the choirs of the saints and beholds in glory the Prize-bestower, our Lord Jesus Christ, to whom be glory and dominion and worship unto the ages of ages. Amen.